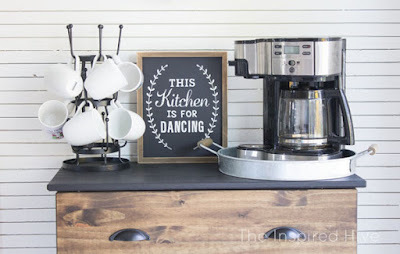 I've always wanted a coffee bar in my house. 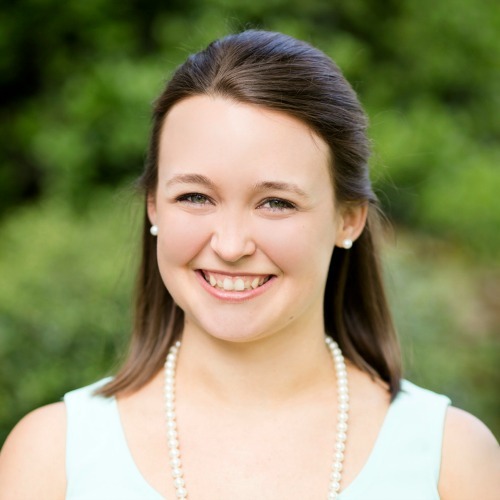 I never liked coffee as a teenager, but when I started college, I found a job as a barista in the campus coffee shop... and so my love affair with coffee began. Thankfully, I have significantly reduced the amount of coffee I drink these days compared to how much I drank while working in the cafe. But coffee and I still have a pretty strong relationship. We own a coffee pot, a Keurig, and a small espresso machine, and we have about a zillion coffee mugs that take up precious cabinet space, so a dedicated coffee station has been high on my priority list. 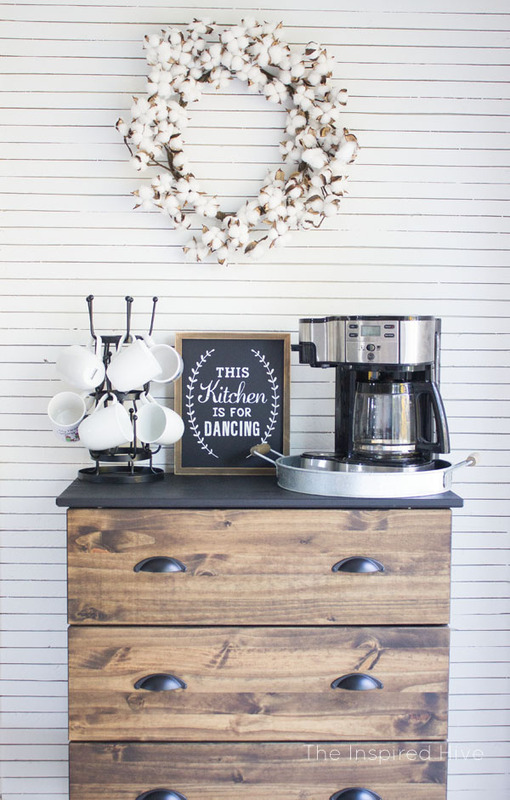 When we decided to makeover our kitchen, it was the perfect opportunity to create a cute little coffee bar! And on a budget thanks to the unfinished furniture available at Ikea! 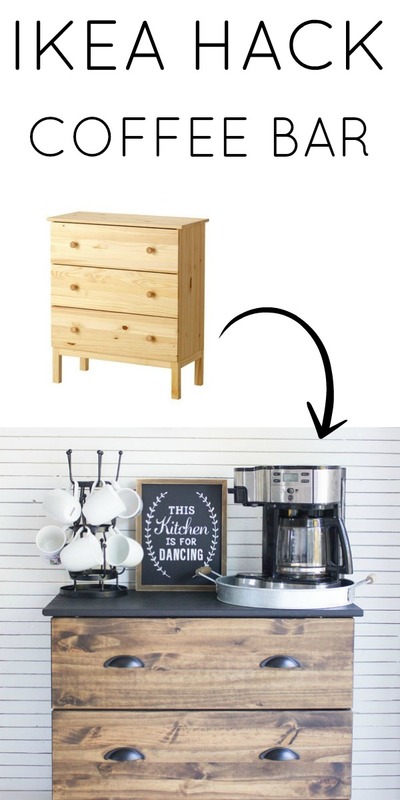 Check out our simple Ikea hack plus all of the coffee bar essentials hidden in those drawers! Start with an unfinished dresser. 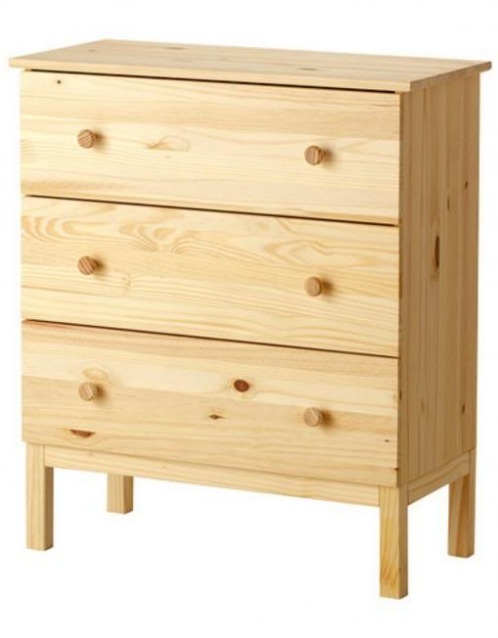 I used the 3-drawer Ikea Tarva dresser. It's not currently listed on their site, but they do have them in my local store, so check yours! Tarva does come in some other sizes as well, or the Ikea Rast is another unfinished dresser. When you put the dresser together, leave the drawer fronts off for now. Don't install the knobs that came with the dresser. Stain the drawer fronts on all sides/edges using the stain of your choice (this is my favorite color) and a cloth. I like staining with these disposable cloths from Home Depot. I use one to dip into the stain can and wipe on and another cloth to wipe off the excess. Paint the base of the dresser in the color of your choice (I used flat black). I chose a paint with primer in it since this is an unfinished piece. I did two coats of paint. Attach your new hardware. I chose flat black cup pulls from D. Lawless Hardware. Use a cabinet template and drill to make pilot holes, then install using a screw driver. Ikea wood is soft, so be careful not to over tighten or your hardware may sink into the wood! Wondering where I found that cute sign? It's from Hobby Lobby!!! Interested in how to make the skinnylap feature wall behind our coffee bar? Get the tutorial here! 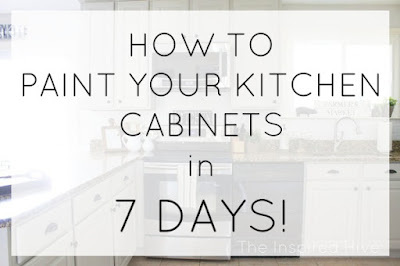 How To Paint Your Cabinets in 7 Days!